Konti is a key figure in the realm of turn of the century American sculpture. He taught and influenced sculptors such as Manship and Kalish, was highly regarding by Daniel C. French and worked on a commission with Gutzon Borglum. He did not cast works in high numbers and often all collectors are able to come by are casts of his book ends. This work precedes his well known Genius of Immortality in the collection of The Metropolitan Museum of Art by almost ten years. Orpheus is conceived while Konti shared a studio at 55th Street in New York with Hermon MacNeil and Evelyn Longman was his studio assistant. 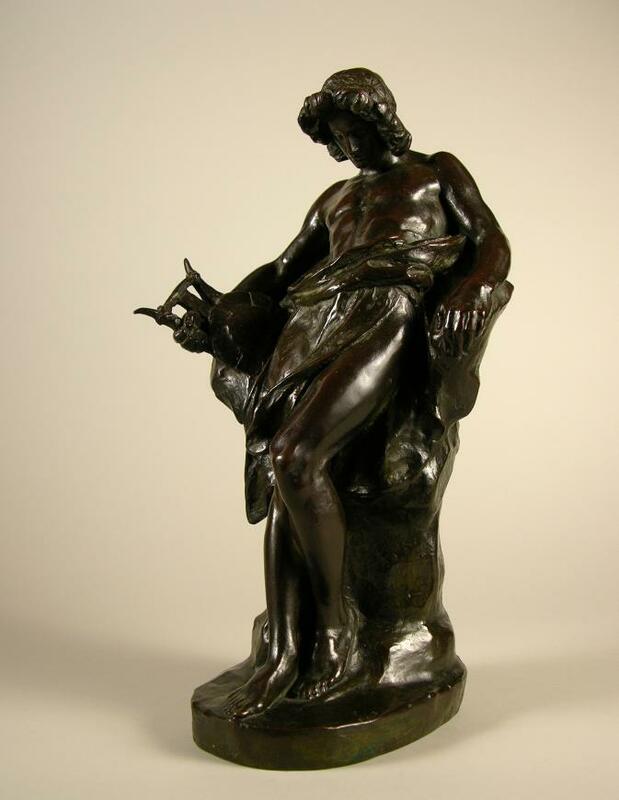 It epitomizes the Beaux Arts classical style that Konti adhered to for his small ideal bronzes and his large architectural and monumental work. It depicts Orpheus at his ultimate moment as he descends into Hades with his Lyre to rescue Eurydice.